Amplex networks provide reliable and secure solutions that allow you to easily share data. 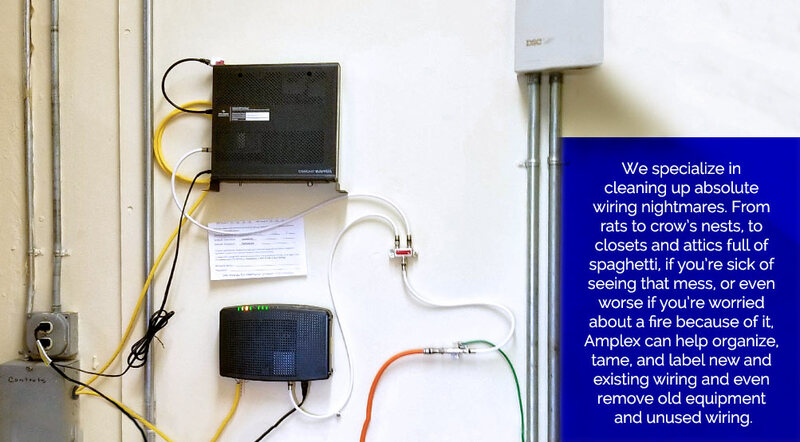 We only use name brand products to ensure Amplex networks are built with quality and performance in mind. By harnessing the power of the latest technologies we are able to boost wireless signals for increased capabilities. We not only diagnose and repair hardwire and wireless and connectivity issues, we also take the appropriate actions to prevent the same issue or issues from happening again. This includes locating both ends of each wire and properly labeling them to ease diagnosing issues in the future saving time and money. NEED A STRONGER SIGNAL? WE CAN HELP. Amplex specializes in covering extremely large areas with WiFi. Contact Amplex Technology Services today to discuss your networking needs. Most of our clients are repeat clients, and for good reason. It all starts with an onsite consultation. Call us today to schedule an appointment.